SALEM — Chance of snow? Expect a sprinkling of salt too. On the first 11 miles of Interstate 5 north of the California border, the average number of winter crashes dropped from 115 to 54 after the state's transportation department started using solid salt on a trial basis. Because of the apparent success of that pilot program and directives from the Legislature, the state will continue to use salt sparingly on some major roadways this winter. While it can be difficult to peg the exact cause of crashes, and the figures fluctuate from year to year, officials found that the two areas they tested as part of a pilot program from 2012 to 2017 saw a decline in crashes after they tried salt. "It was amazing to see," said Dave Thompson, a spokesman for the Oregon Department of Transportation. "The salt was really effective and still we wanted to minimize its use." ODOT will have salt on hand for the first 100 miles of the freeway north of California, on 200 miles of Interstate 84 and in hilly parts of the Portland area, as well as a 121-mile stretch of U.S. 95 in southeastern Oregon between Nevada and Idaho that was tested as part of the pilot program. Since the 1990s, the state has used a liquid chemical deicer, which isn't always enough to keep snow and ice from bonding to pavement, ODOT says. The state has largely avoided solid salt, which can have deleterious environmental effects and is expensive to store. Solid salt has the same chemical composition — sodium chloride — as table salt. Salt, through road runoff, can make its way into surface water, groundwater and soil, which can make it harder for plants to absorb water. It can also corrode roads, bridges and vehicles more quickly. But salt can also be effective, especially in certain conditions, like freezing rain, which the transportation agency says is growing more common in Oregon. Salt will be just one component of the state's winter maintenance plans. Through the five years of a pilot program, the department wanted to see whether a small amount of salt could improve highway conditions and cut down on serious and fatal crashes. On average, in areas tested near the California border, state crews applied about 246 pounds of salt per lane mile. In the stretch of U.S. 95 they applied about 190 pounds per mile. A November 2017 report on the pilot project recommended the application of between 150 and 300 pounds of salt per lane mile. ODOT was also required to use the least amount of salt possible to meet its goals, depending on weather and road conditions. 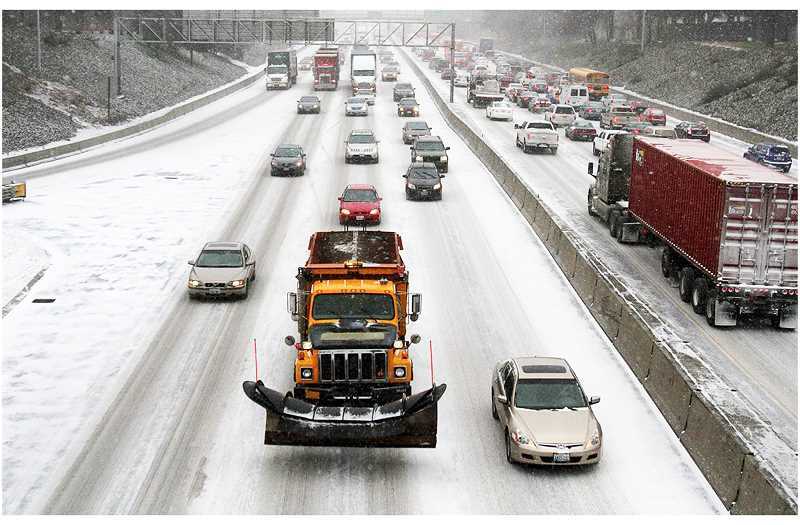 The winter of 2016-2017, which buried the Portland area and Willamette Valley in snow and ice, prompted the department to consider using salt more widely, Thompson said. And last year, lawmakers directed the state's transportation commission to develop a winter maintenance plan that included the use of salt or another solid de-icer. The transportation department may use salt in Portland, Salem and Eugene as it sees fit, Thompson said. The agency will also monitor high-traffic areas and places that get a lot of snow. In Salem, the state maintains parts of Interstate 5 and sections of U.S. Highway 22, said Mark Becktel, the city's public works operations manager. But the city of Salem has no plans to use solid salt this winter, Becktel said. The city doesn't use rock salt but it does use magnesium chloride, another type of salt suspended in liquid. Becktel said the city's forecasters are expecting more ice than snow. "The issues we've been warned to be more prepared for are black ice and ice storms, wind storms, not so much the occurrence of snow," Becktel said. "We would prepare for a full winter either way." Not all snow is created equal. The Willamette Valley is warmer and much more humid than areas east of the Cascades. Central Oregon, which typically sees a lot of snow, is much drier and colder, and powdery snow doesn't respond as well to solid salt, Thompson said. Salt has other drawbacks. Storing it properly can be pricey. The transportation department has requested more money in the upcoming two-year budget budget for more salt storage. The Oregon Department of Fish and Wildlife is concerned that using salt could attract animals to roads, resulting in more crashes. But the transportation department found no correlation between using salt on the road and accidents involving animals.